Jean-Louis Joubert (Fabrice Luchini) is a well off French stock broker who resides, along with his materialistic wife (Sandrine Kiberlain), in a fancy apartment building Jean-Louis owns. They lead a relatively pampered but unfulfilled existence, with their children mostly absent at boarding school and their every whim attended to by their maid. Such is the lifestyle of all who reside in the building, with the exception of the servants (all from Spain) who live on the 6th floor but might as well live in a different world. These two worlds collide when the Joubert's hire a new, young and pretty maid named Maria (Natalia Verbeke). As Jean-Louis becomes enamored of the girl, he also starts taking an interest in the lives of the other servant women, and is surprised by what he discovers. 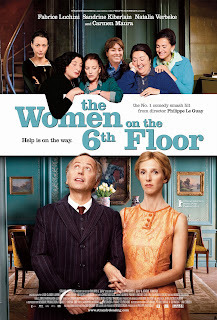 THE WOMEN ON THE 6TH FLOOR is a light-hearted and lightweight romantic comedy with a substantial subplot about class struggle thrown in to the mix. That would be all well and good, but the socio-political satire is handled in so trite a manner that it lacks any real impact. All it takes to bridge the gap between the classes is for Mr. Joubert to spend a little time with the hired help. Almost immediately he begins to realize how shallow and empty his life and marriage have been, and that these poor immigrants who wait on him and his fellow bourgeoisie are human beings with genuine worth, and far better company than his peers, to boot. Hey, it's a nice sentiment, but as much as the film focuses on its subtext, it has little of substance to offer. Laughs prove to be scarce as well; a few witty moments here and there brought a smile to my face, but that's about it. 2 out of 4 stars.